The Stockton Board of Education built the Beideman School about 1865. It was originally called the Abraham Lincoln School. The building stood on a stone foundation and had a wooden frame, with four rooms on each of two floors. Blaine School, Third (now 30th) and Green Streets. Washington School, Fourth (now 27th) and Cambridge Streets. Catto School, 30th and Erie (now Saunders) Streets. Camden now had two schools named for Lincoln, one in East Camden and one on Kaighn Avenue. The commission changed the name of the Lincoln School on Kaighn Avenue to the Claudius W Bradshaw School, in memory of the former Democratic Mayor, who recently died. The wisdom of the name change, however, was "questioned by many sections, because Mr. Bradshaw had never been identified with the public schools." 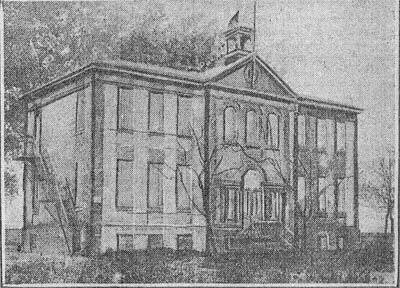 The Harrison School was obsolete and in need of repair and was soon replaced by the Thomas Dudley School at North 23rd and High Streets. The famous old Harrison School at State and River Avenue has been purchased by a Philadelphia syndicate, who will convert the building into a plant for the manufacture of dental and fine surgical instruments. This is one of the first enterprises of this kind to be started in this city. Contractor and builder J.R. Wiltshire, of Pennsauken, has been awarded the contract and has secured the permit from the City Hall to begin work immediately. The plans to convert the school to a factory seem to have fallen through and the old school was demolished. Thanks to Fred Reiss, Ed.D. , for writing the defining book on public education in Camden prior to 1948, PUBLIC EDUCATION IN CAMDEN, N.J.- From Inception to Integration, from which much of the above history of the Kaighn School is derived.